In the tightly knit world of global finance, what happens halfway around the world can have devastating effects at home. Case in point: the fallout from the recent Swiss bank decision to drop its cap on the franc, which is hitting even US banks and the sturdy dollar. The Swiss National Bank’s move to let the franc float against the euro went largely unnoticed outside of financial industry ad business news. But the move was widely viewed as another salvo in what’s being called a modern currency war – and that meant it had wider implications for currencies all over the world. In mid January 2015, the Swiss National Bank removed its three-year-old cap on the franc;s exchange rate against the euro. The move had been intended to keep the franc from appreciating too much against the euro. The European Central Bank was planning its own version of quantitative easing, a plan to stimulate the euro zone’s economy by buying up large amounts of securities. The plan would put more euros into circulation – and that by extension would increase demand for the Swiss franc, a favored “safe” currency for chancy times. In order to pave the way for the ECB’s plan, the Swiss had to bow out, relinquishing the capon exchange rates for the franc and letting it “float” against the euro. It was a costly maneuver, to be sure. Some investment firms crashed and the Swiss National Bank was compelled to buy up massive amounts of foreign currencies to keep pace. Though the immediate fallout from the Swiss decision was felt in adjacent Ares such as Eastern Europe, where much national debt is denominated in Swiss francs, it also rippled around the world, hitting even US megabanks such as Citigroup. In addition to its place as one of the largest banking institutions in the US, Citigroup is also the world’s largest currency trader. In the wake of the Swiss National; Banks decision. Citigroup lost more than $150 million, according to a recent article from Bloomberg Business. Though that isn’t much money in the high stakes, high volume world of international currency trading, financial insiders point out that the issue isn’t so much money lost, as it is trust lost. Citigroup’s losses as a result of the Swiss decision point to risky positions on global trading issues – and that might raise red flags for investors. Citigroup isn’t the only one feeling the heat from the SNB’s move, either. Hedge fund management companies, brokers and smaller banks whose transactions involved the franc are also facing losses. And on the international front, major international banks such as Germany’s Deutsche Bank have also faced struggles. Interestingly enough, Swiss banks themselves haven’t suffered significantly – yet. But some industry watchers point out that the long-term effects on Swiss institutions – and the economy a whole – could be severe, as the flow of assets into and out of the country could slow. What’s more, the credit ratings of Swiss banks could suffer, along with their existing accounts with other European banks. With Citigroup and other US banks feeling he impact of the Swiss National Bank’s decision, what does the “currency war” mean for US investors – and the health of the US dollar at home and abroad? European import and export initiatives dealing in euros and francs could suffer. But like the Swiss franc, the dollar is still a go-to currency in most parts of the world, valued for its stability and security. And as the currency wars heat up, vulnerable investors and citizens concerned with safeguarding their assets may well keep turning to the dollar, not the franc, as a safety net in a world of volatile currency trading. Those conditions also make investments on US soil more appealing. International investment in Us real estate, for example, is reaching historic highs, thanks to its reputation as a highly stable asset that can keep investment funds safe from turmoil at home. And as the front lines of the currency wars expand to other areas such as Asia, demand may be even greater for a stable, safe haven for assets and savings. Eno, Aureloa. 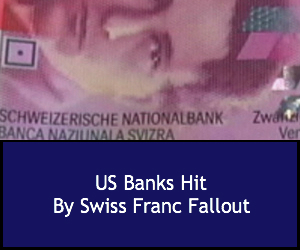 “The Swiss National Bank is the First Casualty of the Modern Global Currency War.” Business Insider. businessinsider.com. 18 Jan 2015. Logutenkovo, Elena. “Bank Losses from Swiss Currency Surprise Seen Mounting.” Bloomberg Business. bloomberg.com 19 Jan 2015. Who’s Winning the Currency Wars?